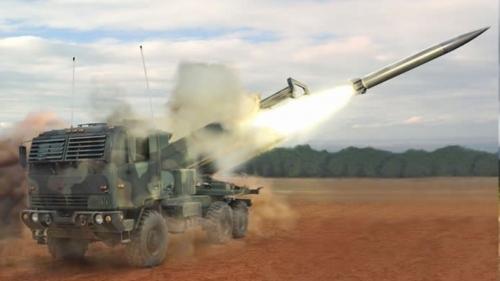 The Army�s new �Vision� for future war calls for a fast-moving emphasis on long-range precision fire to include missiles, hypersonic weapons and extended-range artillery -- to counter Russian threats on the European continent, according to service officials. While discussing the Army Vision, an integral component of the service�s recently competed Modernization Strategy, Secretary of the Army Mark Esper cited long-range precision fire as a �number one priority� for the Army. Senior Army officials cite concerns that Russian weapons and troop build-ups present a particular threat to the US and NATO in Europe, given Russia�s aggressive force posture and arsenal of accurate short, medium and long-range ballistic missiles. �The US-NATO military hospital in Landstuhl, Germany, for example, is in the range span of Russian assets. That is how far things can shoot. You do not have sanctuary status in that area,� a senior Army official said. The senior Army weapons developer said the service intends to engineer an integrated series of assets to address the priorities outlined by Esper; these include the now-in-development Long Range Precision Fires missile, Army hypersonic weapons programs and newly configured long-range artillery able to double the 30-km range of existing 155m rounds. The Army is now exploring a longer-range artillery weapon called �Extended Range Cannon,� using a longer cannon, ramjet propulsion technology and newer metals to pinpoint targets much farther away. Army leaders have of course been tracking Russian threats in Europe for quite some time. The Russian use of combined arms, drones, precision fires and electronic warfare in Ukraine has naturally received much attention at the Pentagon. Also, the Russian violations of the INF Treaty, using medium-range ballistic missiles, continues to inform the US European force posture. Russia�s INF Treaty violation, in fact, was specifically cited in recent months by Defense Secretary James Mattis as part of the rationale informing the current Pentagon push for new low-yield nuclear weapons. The Arms Control Association�s (ACA) �Worldwide Inventory of Ballistic Missiles� cites several currently operational short, medium and long-range Russian missiles which could factor into the threat equation outlined by US leaders. The Russian arsenal includes shorter range weapons such as the mobile OTR-21 missile launch system, designated by NATO as the SS-21 Scarab C, which is able to hit ranges out to 185km, according to ACA. Russian medium-range theater ballistic missiles, such as the RS-26 Rubezh, have demonstrated an ability to hit targets at ranges up to 5,800km. Finally, many Russian long-range ICBMs, are cited to be able to destroy targets as far away as 11,000km � these weapons, the ACA specifies, include the RT-2PM2 Topol-M missile, called SS-27 by NATO. ​It is not merely the range of these missiles which could, potentially, pose a threat to forward-positioned or stationary US and NATO assets in Europe -- it is the advent of newer long-range sensors, guidance and targeting technology enabling a much higher level of precision and an ability to track moving targets. GPS technology, inertial navigation systems, long-range high-resolution sensors and networked digital radar systems able to operate on a wide range of frequencies continue to quickly change the ability of forces to maneuver, operate and attack. While discussing the Army Vision, Esper specified the importance of �out-ranging� an enemy during a recent event at the Brookings Institution. �We think that for a number of reasons we need to make sure we have overmatch and indirect fires, not just for a ground campaign, but also, we need to have the ability to support our sister services,� Esper told Brooking�s Michael O�Hanlon, according to a transcript of the event. The Army�s emerging Long-Range Precision Fires (LRPF), slated to be operational by 2027, draws upon next generation guidance technology and weapons construction to build a weapon able to destroy targets as far as 500km away. LRPF is part of an effort to engineer a sleek, high-speed, first-of-its-kind long-range ground launched attack missile able to pinpoint and destroy enemy bunkers, helicopter staging areas, troop concentrations, air defenses and other fixed-location targets from as much as three times the range of existing weapons, service officials said. Esper specifically referred to this kind of scenario when discussing �cross-domain� fires at the Brookings event; the Army Vision places a heavy premium on integrated high-end threats, potential attacks which will require a joint or inter-service combat ability, he said. In this respect, long range precision fires could potentially use reach and precision to destroy enemy air defenses, allowing Air Force assets a better attack window. �This is why long-range precision fires is number one for the Army. So, if I need to, for example, suppress enemy air defenses using long-range artillery, I have the means to do that, reaching deep into the enemy�s rear. What that does, if I can suppress enemy air defenses, either the guns, missiles, radars�etc.. it helps clear the way for the Air Force to do what they do � and do well,� Esper said. Raytheon and Lockheed recently won a potential $116 million deal to develop the LRPF weapon through a technological maturation and risk reduction phase, Army and industry officials said. Service weapons developers tell Warrior a �shoot-off� of several LRPF prototypes is currently planned for 2020 as a key step toward achieving operational status. Esper also highlighted the potential �cross-domain� significance of how Army-Navy combat integration could be better enabled by long-range fires. �If we're at a coast line and we can help using long-range weapons �. I'm talking about multi-hundred-mile range rockets, artillery, et cetera, to help suppress enemies and open up the door, if you will, so that the Navy can gain access to a certain theater,� Esper explained. While Long-Range Precision Fires is specified as the number one priority, the Army Vision spells out a total of six key focus areas: Long-Range Precision Fires; Next-Generation Combat Vehicle; Future Vertical Life; Army Network; Air and Missile Defense; Soldier Lethality.